No faith in NA here. Year after year, the League of Legends World Championship quickly becomes the League of Legends South Korea Show. Two Korean teams generally end up competing in the finals (usually one of them is SK Telecom T1), and Korean teams dominate the group stage (usually SKT, again). Well, we’ve taken some time to sit down and evaluate which teams are the best of the best for Worlds 2018, and we’re happy to report that now that SKT are out of the picture… it’s still the Korea show. That’s a lie (sort of), because although we think Korea will take home the most important trophy in all of League esports once again, there’s definitely competition this time. There’s at least a possibility that China can rise to the top and prove our rankings wrong. Here is the Dot Esports ranking of the five best teams at the 2018 World Championship. Yes, we’re starting off the power rankings with a tie. We’re just great like that. 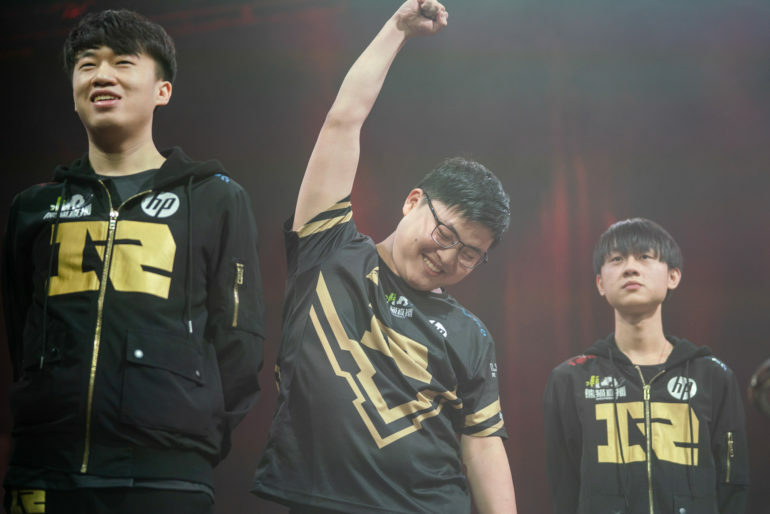 Invictus Gaming were going to be the easy choice, thanks to their utter dominance of the LPL during the regular Summer Split. They have Song “Rookie” Eui-jin, a South Korean competitor who left for China during the great Korean Exodus of players in 2014. He’s completely charmed Chinese fans since then and become one of their favorites. And, what’s more important, the guy’s a monster. Taking a trip down memory lane to glance at his match history is jaw-dropping. There’s a 7-3 kill/death record, a 6-1, a 3-0, a 5-1, a 12-5, a 14-3, a 10-2, and the list just keeps going and going. He carries with an immense champion pool too, from Irelia to Swain to even Varus and everything in between. So why not Invictus? Well, and we might be overthinking this, they remind us a lot of Longzhu Gaming circa 2017. Longzhu were an LCK team that completely crushed the Summer Split, too, with pop-off carries like Kim “Khan” Dong-ha. When they reached Worlds, however, their immaturity and inexperience shone through, and they were crushed by the previously inferior Samsung Galaxy in the quarterfinals. Longzhu were far and above the favorites of Worlds, and yet the team with years of Worlds experience crushed them under their boot in a 3-0 sweep. Invictus are in a similar boat, except they were thwarted by the experienced team in RNG before Worlds in the LPL finals, and that’s a big red flag. Whether they run into RNG again or it’s another experienced squad like Gen.G or even kt Rolster (who finally seem to have put everything together), we’re worried they’ll crumple up again. If they do, we think Fnatic would be the team to take their place. Fnatic have star power this year in Rasmus “Caps” Winther, Martin “Rekkles” Larsson has returned for another year at Worlds, and jungler Mads “Broxah” Brock-Pedersen has turned into quite the terror. No, we don’t think Liquid are better than Fnatic, let’s just get that out of the way right now (as much as we’d like to place an NA team somewhere in the top five). Afreeca Freecs seem to be the latest Korean squad to go from the middle of the pack to a top-tier team, and we think they could have a serious impact at Worlds this year. Korea, as a whole, is more strengthened and honed than they’ve ever been, and the Afreeca Freecs are some of that proof. In fact, every team down through the middle of the LCK pack, including Hanwha Life Esports, were far more impressive than the middle-tier teams from any other region. If Hanwha Life were in attendance, we’d probably like their odds, too, even if we don’t think Afreeca will make a finals appearance. They have a completely full 10-man roster with a sub in every position, and they used that to catch teams off-guard and change strategies on the fly (sort of like Cloud9, but good). We think they’d do better if they were able to carry all 10 to Worlds, so the six-man rule will probably hurt them. Still, their performance in the playoffs, beating both Gen.G and Kingzone DragonX and taking Griffin to five games to go down fighting, was very promising. It proved that they knew how to perform in crunch time against more decorated teams, even as the underdogs almost the entire time. If they can translate that into Worlds, where they’ll have to deal with the best teams from other regions as well, it could be a serious weapon in their arsenal for success. Like we said earlier, it’s still the Korea show, even if a certain Chinese team can give them a run for their money. Gen.G, formerly Samsung Galaxy, were the winners of last year’s Worlds, and although they barely squeaked through the LCK regional gauntlet to qualify for Worlds at all, we’re still a little scared of them. Why? Because it’s the same roster, for the most part, and last year, they were the Korean underdogs, too. No one thought they’d be able to beat Longzhu or SK Telecom T1. Not only did they beat both, but they did so with 3-0 sweeps in the knockout stage and took home the trophy. If that wasn’t this team’s reputation, the reputation of the way-too-successful underdogs, we’d rank them below Afreeca. Afreeca, on paper, are the better team, no questions asked, but this is Gen.G we’re talking about. The momentum from winning the miracle-run through the gauntlet (and the hype that Kang “Ambition” Chan-yong probably felt after seeing himself in Rise) can’t be discounted, especially when it’s this roster we’re talking about. Not to mention, Afreeca are arguably less scary than Longzhu or SKT were last year, so the possibility that Gen.G hurdle them is higher. Then there’s the fact that Afreeca can only bring one sub, which we think will definitely hurt them when trying to keep up with Gen.G. To be clear, though, we don’t think Gen.G will win the whole thing. If they jump past any LCK team, it’ll probably be Afreeca and stop there. Kt Rolster are just too good, and even if kt choke (which, hey, it’s kt after all), the likelihood that Gen.G can then take down RNG is still slim to none. We wouldn’t be too surprised if that’s exactly what happened, because look at who we’re talking about. We wouldn’t put money on that, though. RNG may have won the Mid-Season Invitational this year, but we don’t think they quite have what it takes to win the whole thing (although it’s definitely up for debate). They’re here, once again, as the underdogs. They’ve always been within a finger’s reach of greatness, and there’s so much fuel on the redemption fire at this point that there’s a chance they just rage past the competition and prove us all wrong. That being said, the competition at this year’s Worlds is way higher than it was at MSI. For starters, Kingzone (previously Longzhu) aren’t here to choke and make a fool of Korea. Kt Rolster are another beast to conquer entirely, and they’ll end up being RNG’s white whale. They’re better than Kingzone, they finally, for once, didn’t fall short in the LCK playoffs this summer, and that means the kt Rolster super team have made it to the Worlds stage. If any other LCK team had taken the first seed, RNG would probably be favored to win, and here’s why. RNG’s secret but not-so-secret weapon is Jian “Uzi” Zi-Hao, the best bot lane carry in the entire world, and at least in the conversation for the best player in the world altogether. When he gets fed, or even breaks even in the bot lane, there isn’t a single bot lane player in the world that can carry a game like he can. He steams past all competition, and RNG rely on protecting and feeding him resources so he can do his thing in every game they play. Here’s the thing, though. He’s still just a bot laner. Bot laners require time and resources to carry a game, unlike a mid, jungle, or top laner, and that means RNG as a whole need time to feed Uzi. The only reason they’re so successful is because no team has been able to pressure RNG’s much-weaker positions to the point where Uzi can’t get what he needs. We think that kt Rolster will be the team to do that, but if they can’t for whatever reason, there isn’t a doubt in our minds that RNG will take home the title they’ve been after for so long. Kt “Super Team” Rolster has been talked about throughout the international League esports scene for years. But the conversations usually sound something like “will they actually win this time?” You see, kt Rolster are infamous for having a completely stacked roster and still, like a broken record, falling short in the LCK playoffs. That’s the reason they’re almost always praised for being incredible, but you still curiously never see them at Worlds. Well, this year, they finally won the LCK Summer Split playoffs, and that means they’ve been unleashed on the Worlds stage. And, just like their years in the LCK, that means that we have to bet on them, because these players are just so damn good. If any team can match RNG by putting all resources in the bot lane, its kt, because the top, mid, and jungle should destroy RNG in one-vs-one fights. But make no mistake, we’re certainly cautious here. This is kt we’re talking about, and they have perhaps the most prominent reputation for choking when it counts. That being said, there’s a big chance that they choke against RNG and hand over the title. But if everything goes according to plan, and RNG play at their best against kt Rolster playing at their best, we don’t think kt will lose.